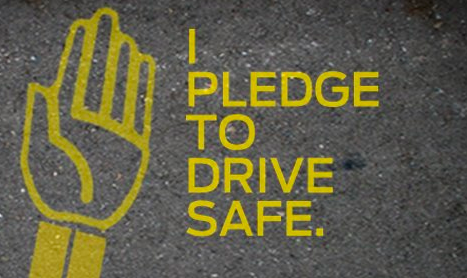 Driving is fun but it can be dangerous when you are driving irresponsibly. According to the recent stats more than 1.34 lakh people have died on Indian roads in the year 2010 and the number increased by 30,000 in 2011. That’s not the only shocking fact, with the loss life India also loses $20B annually to road accidents. These numbers reveal some harsh realities of not driving safely and I am quite happy to see that Ford India, the global automotive industry leader has initiated “I Pledge To Drive Safe” Facebook campaign. The Facebook app has multiple pledges that you can take and if you are confused what all they mean then just click on them and get informed. I took the “Belt Up” pledge and once you click on the pledge you are informed about the details of the pledge. In my case the pledge was to wear the seat belt and once I was convinced with the pledge I clicked on the button “Click here to take this pledge”. On click, the app pops up and shows you the message that is going to be shared on the Facebook wall. This is the way Facebook apps should be following the guidelines. Initially during the authentication process I had allowed the app to deliberately post content on my behalf on the wall. However according to Facebook app guidelines,the app needs to show the user the content every time that it wishes to share on his/her wall. I am impressed that Ford India is following the right procedures. Once the message is posted on your wall, your friends can check it out Ford India also provides the “I Drive Safe” stickers for your car. You simply need to fill up a small form with relevant details and the sticker is sent to you. Apart from this the app also has a Leaderboard and Terms & Conditions section for you to explore. Leaderboard is a small dashboard, which provides you some interesting facts such as “Most Popular Pledges”, “Top Pledgers Of the Day”, “Top Pledgers”, etc. The initiative that has been started by Ford India is a welcome campaign, which talks about safe driving. The app that has been built is easy to use and simple to understand. Even if the incentives are not that great, fans would love to take pride in sharing amongst their community that they are supporting a motion. However, the campaign at this phase ends with the stickers or taking a pledge. If the brand could take this further and actually find out how many people have implemented the pledges in real life then it would be really significant. It may be a challenge to do so but it would be a great road ahead for such CSR campaigns. Do you think these campaigns should think of carrying the implementation further? I am sure most of the us would forget the pledges once we move out of Facebook. What do you think?